On Tuesday, we delved into tile puzzles and games, exploring dominoes, mahjong, and sliding-tile variations. Letter-tile games may not have the centuries of history behind them that those listed above do, but you simply cannot talk about tile games without discussing one of the world’s most popular and recognizable brands: Scrabble. Scrabble was created in 1938 by an architect named Alfred Mosher Butts, and was adapted from a word game he’d invented previously, known as Lexiko. His second attempt at the game — delightfully titled “Criss-Crosswords” — combined the letter tiles and values of Lexiko with the gameboard and playing style that we’ve all come to know. The game wouldn’t become a household name until years later when it was marketed and sold by Milton-Bradley. Nowadays, of course, the brand is not only known worldwide, but in myriad forms. Our friends at Hammacher-Schlemmer not only sell an extended version allowing for longer words, but a magnetic version and a giant version, dubbed the World’s Largest (with good reason). Several Penny/Dell puzzles are based on the Scrabble model, and those signature tiles have appeared in game-show form and made an impact in the pop culture lexicon, offering more than a few magical moments to author Joe Hill’s thrilling horror novel NOS4A2. And then there are the electronic versions. From Wordfeud and Words with Friends to Scrabulous (later known as Lexulous after several lawsuits), Scrabble and other letter-tile games (like Dabble and David L. Hoyt’s puzzle-game Word Winder) are ubiquitous in app stores and all over the Internet. 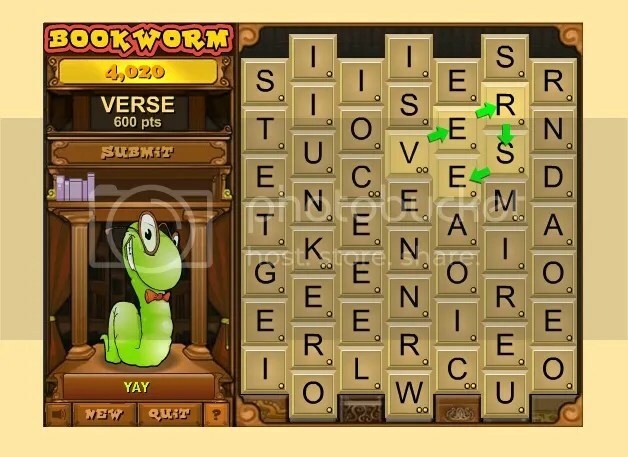 I was recently introduced to Bookworm, a very addictive puzzle game that deftly mixes the pattern-busting appeal of Candy Crush and other games with the Scrabble aesthetic of assigning point values to various words, encouraging you to find longer and more complex letter chains in order to score more points. But there are board game variations as well. A particular favorite is Upwords, which is basically Scrabble, except the tiles are designed to allow you to stack them atop each other, spelling new words as you use your opponent’s moves against them. For instance, if your opponent played HENCE, you could place an F atop the H and an I atop the E, and then add other letters to the end, creating the word FENCING. 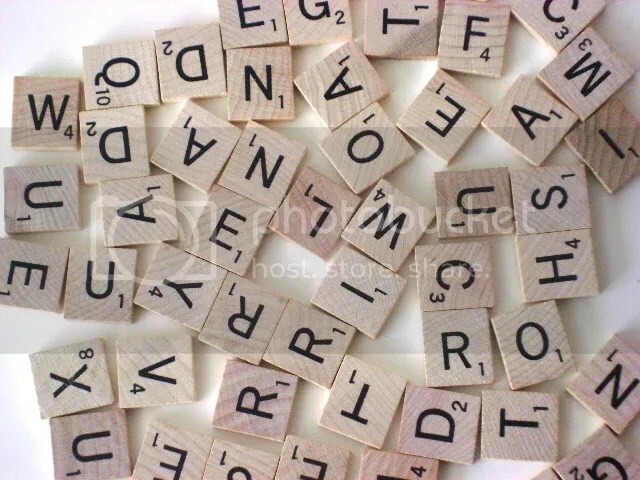 All of these letter-tile games and puzzles encourage anagramming skills, strategy, and a dab hand at quick math — being able to tell if you’ll get more out of a double-word short word or a triple-letter longer word, for instance — but there’s another letter-tile treat that adds a bit of speed to the mix: Bananagrams. Bananagrams works on the same principle of adaptability as Upwords, encouraging anagramming in order to use up every letter tile in your hand. Launched in 2006 as the brainchild of Abraham Nathanson, it breaks free of the board game aspect of Scrabble and Upwords, allowing you to play anywhere, trying to out-anagram and out-grid-build your opponents in the shortest amount of time possible. 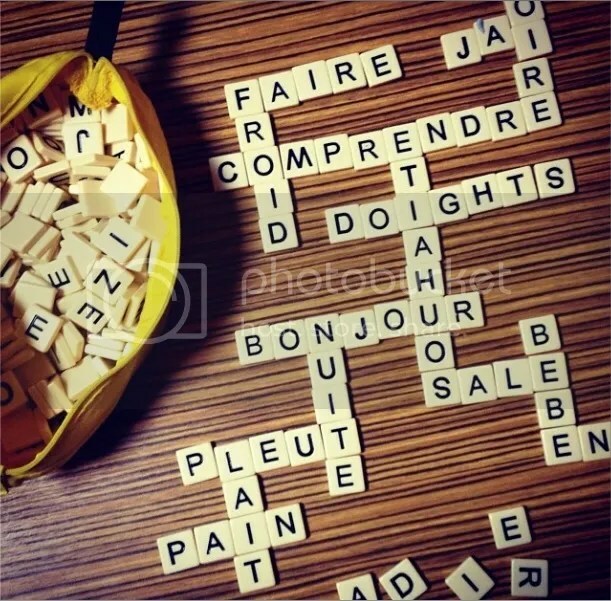 Lesley told me that, much like Scrabble, there are Bananagrams products for multiple languages (in case any Francophiles out there looking for the best possible chance to exercise their multisyllabic linguistic chops). In the end, I doubt there’s a better vocabulary-building tool on the market today than any of these letter-tile games and puzzles. Whether you’re reaching for a banana-shaped bag full of tiles, a magnetic strip of letters, or the app on your iPhone, you’re sure to learn new words, big and small, the more you play. This entry was posted in Games, PuzzleNation, Puzzles and tagged abraham nathanson, alfred mosher butts, anagram, bananagrams, beckie0, bookworms, candy crush, Dabble, David Hoyt, David L. Hoyt, games, Geeking Out, Hammacher Schlemmer, james brunot, joe hill, lesley singleton, Lexulous, milton-bradley, nos4a2, Penny/Dell Puzzles, Pop culture, PuzzleNation, Puzzlin' fool, rebecca brown, Scrabble, scrabulous, Upwords, Word Winder, wordfeud, Words With Friends by gmdirect. Bookmark the permalink.